The Light Storm 300D is the brightest so far in the Light Storm series. It boasts 48,000 lux at 0.5m with its included reflector. It can also reach 142,000 lux at 0.5m with the Fresnel mount. With this power, it just about doubles the power of the Light Storm 120D. As for the color temperature, the LS D300 is set to daylight 5500K. It features a CRI rating of 95+ and a TLCI rating of 96+. If you are not sure what those mean, they mean awesome color accuracy. The LS D300 features a Bowens mount, so you can add virtually any Bowens mount accessory for shaping the light. This gives you much more versatility and control over the light. Although Light Storm D3000 is comparable to a 2,000W tungsten lamp, it weighs less than a quarter of it. The weight of this light is 4.6 lbs (2.1kg), and it’s 13.5 inches long. You can easily hold it or modify the light with one hand. 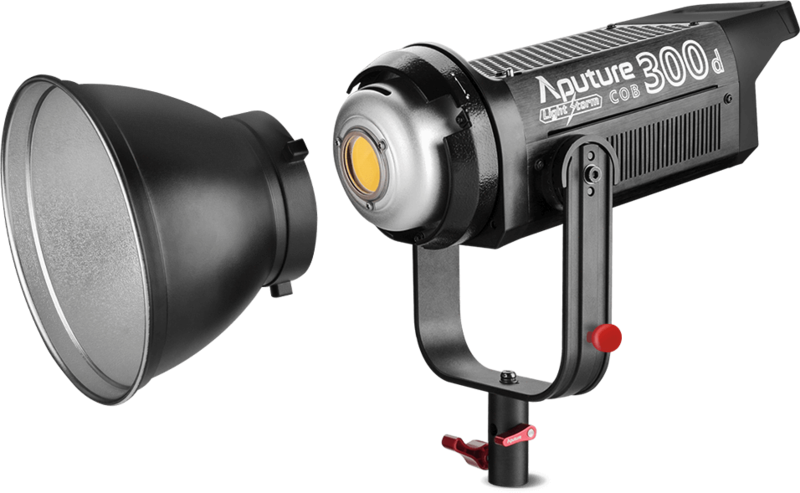 Aputure claims that despite the size, the light features a strong, durable build. When it comes to the power, The LS 300D can be powered either via AC, or you can mount either 2 V-Mount or 2 Anton Bauer batteries. You can control the light with a wireless remote from up to 150m away. You can buy Aputure’s Light Storm 300D here for $1,099.00. It would be great to know how much power it draws (amps) when plugged in. Also it has fans that are described as “very quiet”— quiet enough for audio recording? They never gave the real light power at 3 meters away nor tells the total weight including the battleship tethered control and loud power supply. Do you really think clients like to be blinded with light at 0.5 meters (about 1.5 feet)? Heck no. When was the last time you even use a speedlite to blast your client in full power at 1.5 feet and say I got a powerful flash?